Windows Vista replaced Windows XP as the main operating system from Microsoft. It is primarily used for personal computers including home and business environments. Microsoft Vista was released to the market on November 8, 2006. In addition we have partnered up with Lynda.com to get you FREE 7 day access to Windows Vista training courses for Free!! One of the new features in Windows Vista is the ability to start programs and applications without knowing the complete hierarchal path. Let us say that you tend to use PowerPoint a lot to create presentations. In the previous versions of Windows, you would have to browse to Programs, Microsoft Office and then Microsoft PowerPoint, not anymore! Let us show you a quick and easy way of finding the program instead. When you click on the Start button, right below All Programs you will see an area that reads Start Search. Go ahead and enter PowerPoint in this location and click Enter. 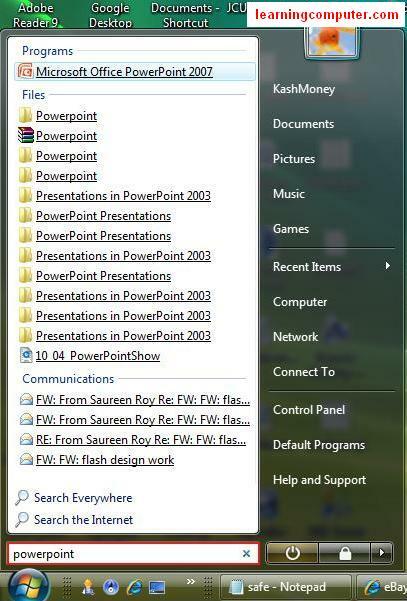 You will notice that the computer will go ahead and search Files and Programs with the word PowerPoint in it.The first option on the top under Programs is Microsoft Office PowerPoint 2007,go ahead and select it. This will launch Microsoft PowerPoint in just one step.Very Nice! Here is what it looks like on the computer monitor, notice the Start Search area is highlighted in red. Using the Start Search method, not only are you able to find Programs and Applications, you can also look for files and related documents We saw this in action above when it found files and communications (Outlook) related to PowerPoint. 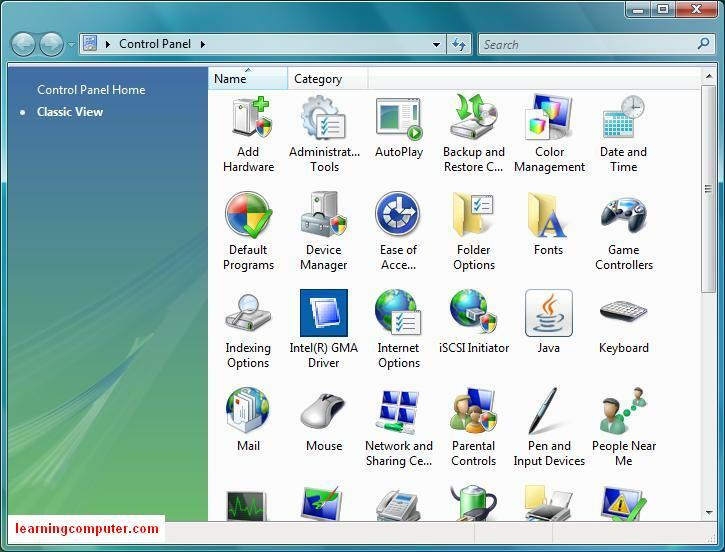 In this manner you can work more efficiently in Vista operating system than you could in previous Window environments. Let us do the same thing to launch the WordPad application next. In the Start Search area, simply type wordpad. 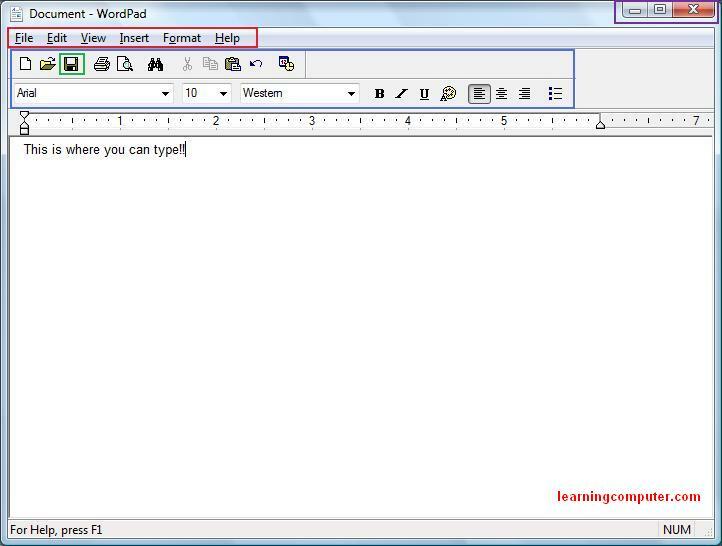 Under Programs you will see WordPad, go ahead and launch the application. 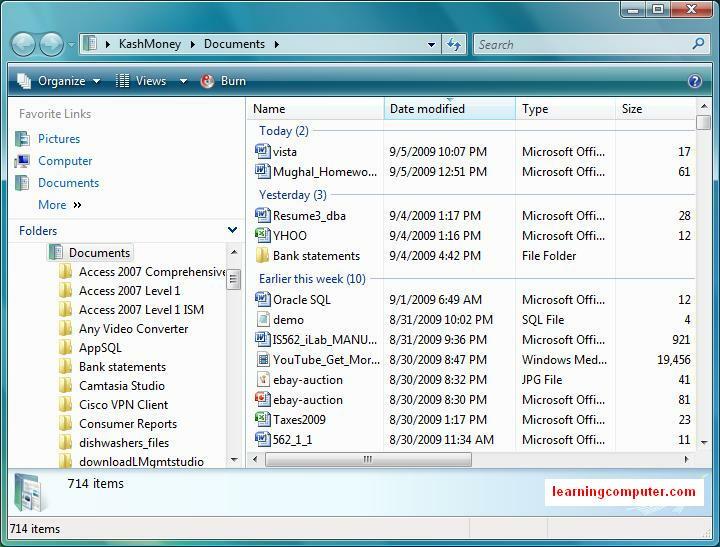 In the above screen shot, we have highlighted different sections which are common in a typical Windows application. The top portion where it reads File, Edit .. is known as the“File menu” (in red). This menu can be used to do a number of tasks like opening or closing a document, changing the font properties, format options, browsing through the Help section etc. Right below the File menu is what’s known as “the Toolbar” . This This contains several commonly used commands. For example in order to save a file, you can use the File menu, or simply click on the Save icon which is highlighted in green square. You will notice the ruler below the Toolbar which is helpful from a printing point of view. Next you will notice the big white space where you will be entering the actual information. On the top right corner you will notice three icons. These let you control the behavior of the actual program window. The first one is used to minimize the program that you’re working in, the second one (square) is used to restore the program to its original viewing size and the last one (x) is used to close the application. We just felt necessary to cover some of the basics of working with Windows programs and applications especially if this all new to you. 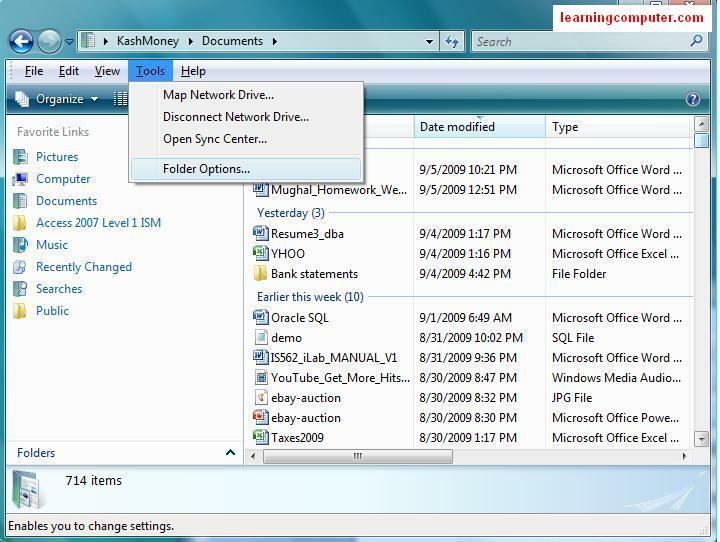 Now that we have covered windows training on how to start an application and manage the environment, let us move on to second part of our Windows Vista Tutorial, working with files and folders. 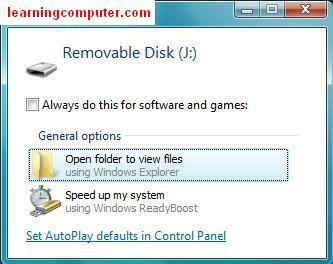 In order to work with files, you will need to use Windows Explorer. It can be found under the Start menu. When I did this on my computer, it went ahead and took me to the Documents folder. 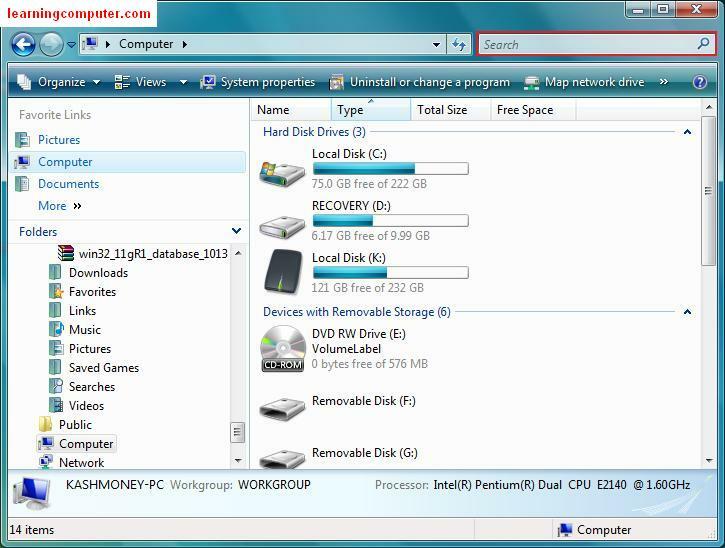 This is considered to be the default location where Windows Vista will store your files. Here is a screen capture of what it looks like on my computer display. 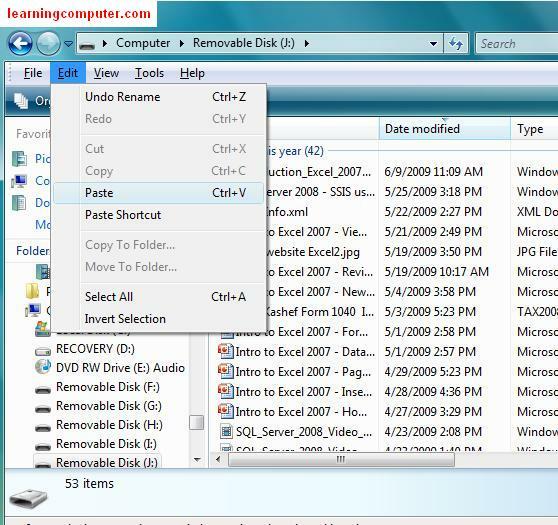 You will notice that the Windows Explorer area above is split into two panes (sections). The one on the left is the Navigation pane and the one on the right is the Details pane. The navigation pane is further broken down into Favorite Links and Folders. 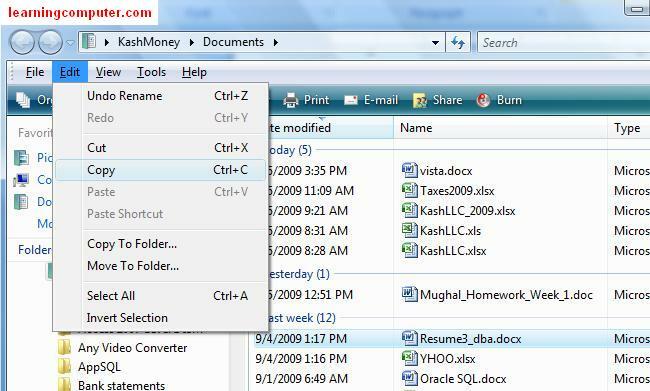 You can easily browse to the needed location by double clicking on the desired folder. As you click on these folders, the detail area will change accordingly and will list different files and folders. On the right side you can see detailed information on the files and folders. This can include things like name of the file, when it was modified, what type of document it is, so on and so forth. Also observe that our files are listed by the Date modified in descending order. From the details pane, you can simply open up the necessary document by either double clicking on it or using right click and then selecting Open. One of the things that I find myself doing is customizing the look and feel of Documents folder. I typically like to see the file extensions and also want to see the Date modified on the left side. How do we do that? First let us move the Date modified to the left. You can select the column heading and holding the left mouse button you can simply drag the column to the left. This will rearrange the details pane and now you’re left most column would be modified date. Here is a screen capture of this action right below. For the next step, you need the File menu which currently is not visible. Go ahead and select Alt + F which will make the File menu visible. Next select Tools menu . You will see a drop down like the one below and select Folder Options. This will launch a new dialog box titled Folder Options . 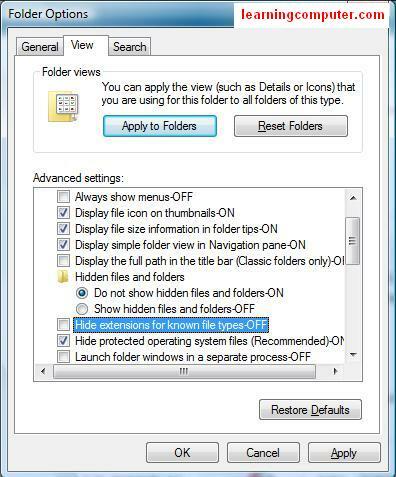 Go to the View tab and under Advanced settings check the option Hide extensions for known file types-Off. Go ahead and click on Apply and then select OK.
We have included the screen shot of this step as follows. By the way you can always revert back to the original settings by clicking on Restore Defaults. 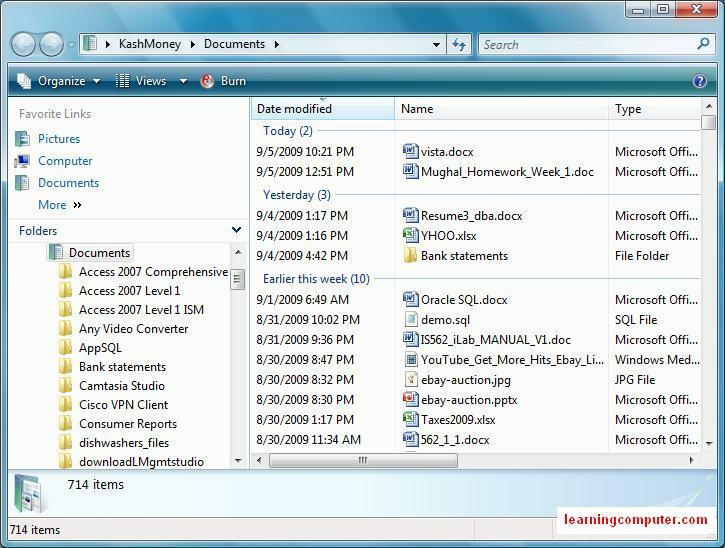 This time when you open up Windows Explorer, you will notice that the first column is Date modified and for the file names, you will notice extensions like .docx (Microsoft Word), .xlsx (Microsoft Excel), etc. I find this helpful if I am working with different versions and not sure what type of file I am working with. This is what it looks like on my computer display. – What is Windows Vista? – Try Microsoft Windows Training – Highly Recommended!! We have already seen how easy it is to search for programs earlier. 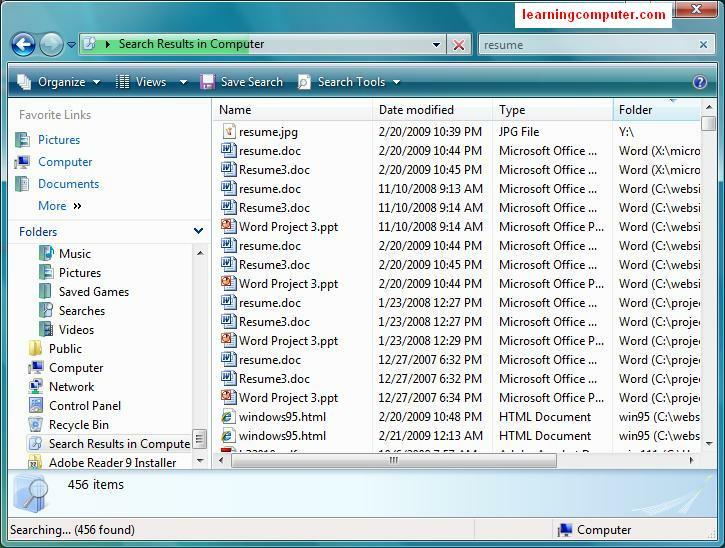 Next we will search files and folders using Windows Explorer. Let us say that you are starting to do some job hunting and would like to pull up all your resumes that are floating around on your computer, I know I have a few of them around! How do you do that? You can simply click on the Start button and then select Windows Explorer . In the left pane, select Computer from Favorite Links. In the detail pane you can see all the fixed and removable storage devices (disk or drive). You will also see a Search bar in the top right corner (highlighted in red). This is where you can type resume and hit Enter. The computer will go ahead and search all the documents with title or text that includes resume. The next two computer snapshots show what we are talking about. While the computer is searching for documents, you do not need to wait for it to finish. If you notice 0 the file that you are looking for, you can double click on it which will open it. Another way you can search for files is to use the Search option from the Start menu which will essentially lead to the same results as above. I will say one more thing about searching files and folders. In the past I have preferred using Google Desktop over the Windows native search tool as it was a lot faster. However in the new version of Windows, the search capability has improved considerably so either one should work just fine. Media can include a number of things like music, videos, digital pictures and external sources like TV, cameras etc. We will go over some of these options in this portion of Vista Tutorial. When you are trying to play an audio CD or a DVD, the first thing you will need to do is put the CD/DVD in the CD tray. Next you will see a similar dialog box to the one shown below. In my case, I am trying to play some videos from a DVD. If you find yourself using the same application all the time, I would go ahead and check the box Always do this for video files so that it does not prompt you again. 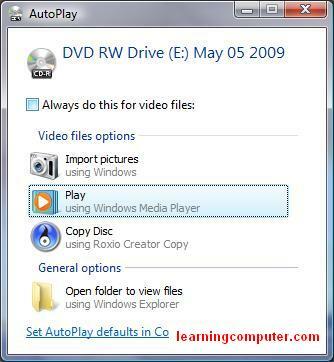 Go ahead and select Play using Windows Media Player and then click OK. This should launch Windows Media Player and start playing your music CD or DVD. If you want more info on Windows Media Player, we cover the details in our Windows XP Trainingpage. The next thing we will a cover in our Vista training is working with USB devices. Let us say that you are trying to copy some files from your computer hard drive to a USB drive also known as a Thumb drive. We will show you how you can get this done. First you need to stick your thumb drive into one of the many USB ports on a typical computer. When you do that, you will get something similar to the following dialog box. Go ahead and choose Open folder to view files and then click OK. It will go ahead and open Windows Explorer and let you browse files and folders that are currently on the Thumb drive. We are going to copy one of my resumes from the Documents folder to the Removable Disk J. We browse to the Documents folder, select the correct resume and choose Copy from the Edit menu. This step is shown in the figure below. Next browse back to the Removable Disk which is J in our case. Select Pate from the Edit menu to copy the resume to the new location. We have included the screen capture of this step. We are not going to go into a lot of detail on the Control Panel as there are several topics here. We do have some video training with details on the Control Panel features in Windows XP lesson so feel free to check it out also. For today we will be covering Administration Tools, Program and Features, and Security center. 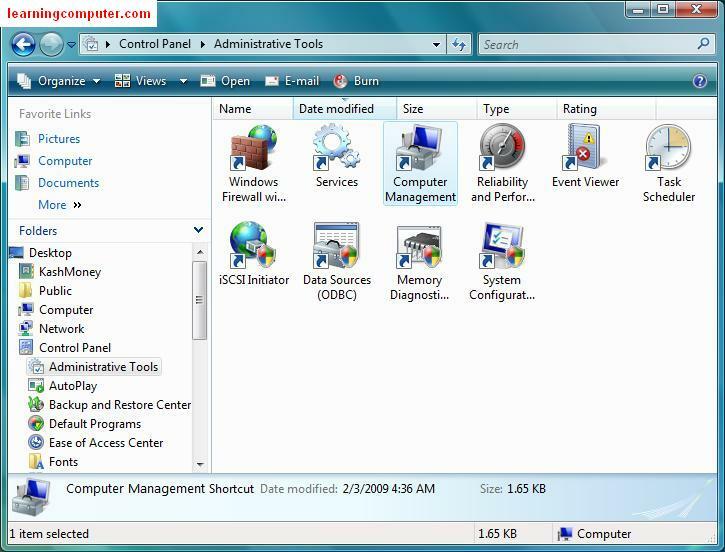 For this part of Windows Vista Tutorial, we are going to take a look at the Administration tools which can be used to control Services, view Events, perform Computer Management etc. Let’s go ahead and look at the Computer Management features. When I clicked on this option, I got a dialog box which is in place for as a security mechanism. You have to click on OK to proceed to the next step. I have included a screen shot of the options available under Administration Tools. Event Viewer: This important tool can help you troubleshoot issues that may be occurring with your computer. The Event Viewer is further broken down into Application, Security and System related events and logs. Tasks Scheduler: The task scheduler can help you automate different actions on your computer. For example you could set up a task to shut down the computer at a certain point. A task needs a trigger or a condition to start the task and secondly it needs an action which is the actual work done by the computer. 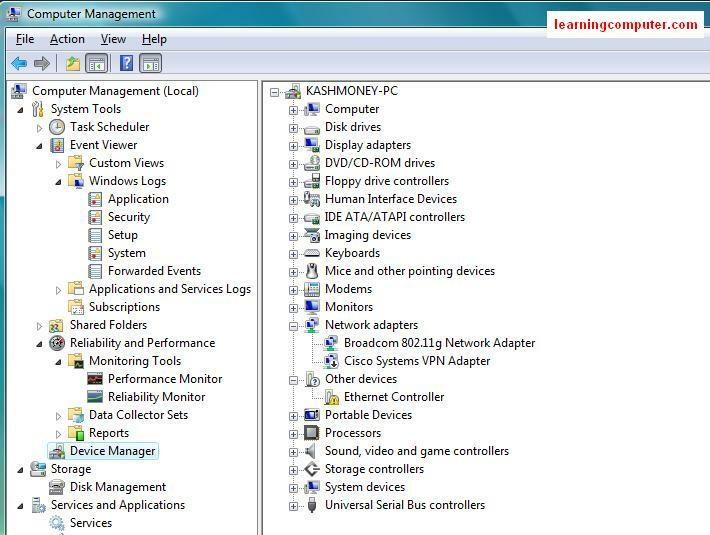 Device manager: When you run into hardware type issues or you need to update a driver, you can use the Device Manager to take care of such problems. The typical device manager will provide all the hardware components by category and then you can further drill down to the component level. Services: The services tab will let you start and stop different services on your machine. We have included a screen shot off a Device Manager here with some of the tabs expanded so you can see the details. If you would like more info on Device Manager, this website does a good job of explaining it in detail. 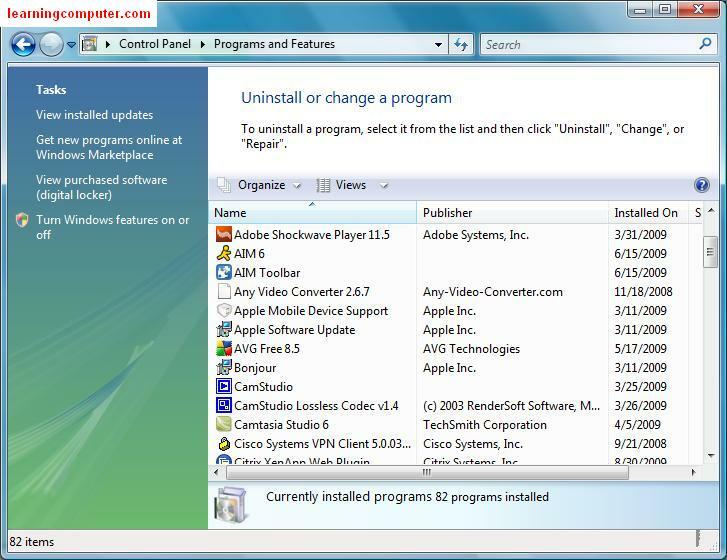 Using the Program and Features, you can install or uninstall applications from your computer. This is also useful when you are trying to update some of the optional features under Windows operating system. When you click on it, it will go ahead and list all the installed the applications in an alphabetical order. I have included a screen shot of what is currently on my computer. For the next Window Vista demo step, let us go ahead and try to uninstall one of these applications. I do not use the Camstudio any more so I can safely remove that program from my computer. When I double clicked on Camstudio, I was given the following dialog box. 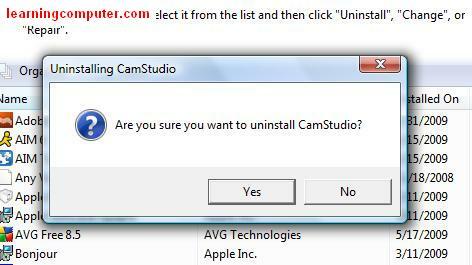 It is simply confirming that I want to indeed uninstall Camstudio. I will go ahead and click on Yes. It will go through a few steps and uninstall the application as needed. The last important item we want to cover in our Windows Vista Tutorial is Security. 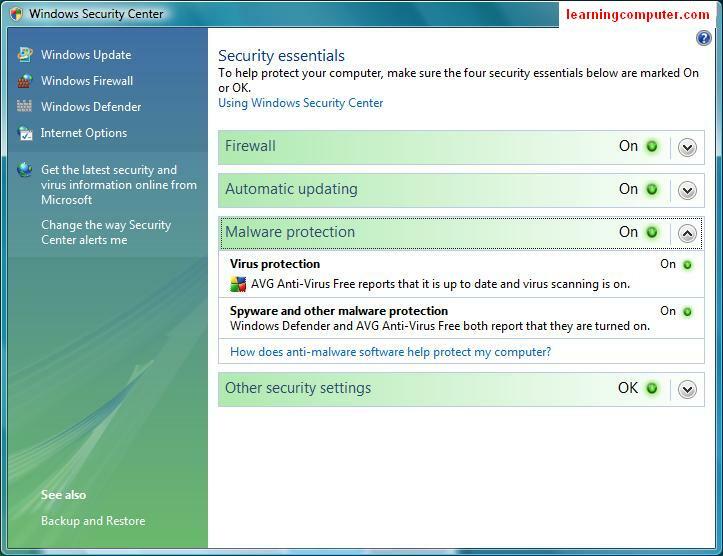 Security center allows you to turn on important features related to protection of your computer from viruses, worms, spyware and adware. When you launch the Security center, you will notice the different settings that are either turned on or off. On the left site, you have additional features which we will look at first. Using windows update, your computer will automatically check for latest updates, bug fixes and service packs for your operating system. Microsoft is constantly coming up with new patches and updates so it is a good idea to turn this feature on. Windows firewall helps protect your computer by blocking traffic from the outside. This could include traffic from the Internet or a Computer Network. It can also stop your computer from sending malicious software to other devices. Windows defender is a free tool from Microsoft. It detects viruses, spyware, malware and adware applications from your computer. In order to use this, you will need to first validate your copy of Microsoft Windows. The Internet options let you control configuration settings for your Internet browser. You can set up your homepage, delete browsing history, manage security levels, privacy settings, enable or disable other configuration parameters. You can also get to this from the Tools menu in Internet Explorer. Lets go ahead and look at the Security Center on our computer. When we selected this option, it launched the following dialog box. You will notice that most of the security mechanisms are in place for our computer which is a good thing. However the Virus protection is turned off, that is not good! You can click on Monitor now which will let you enable this option. We are using AVG Anti-virus in our computer, so that is the option we will select. 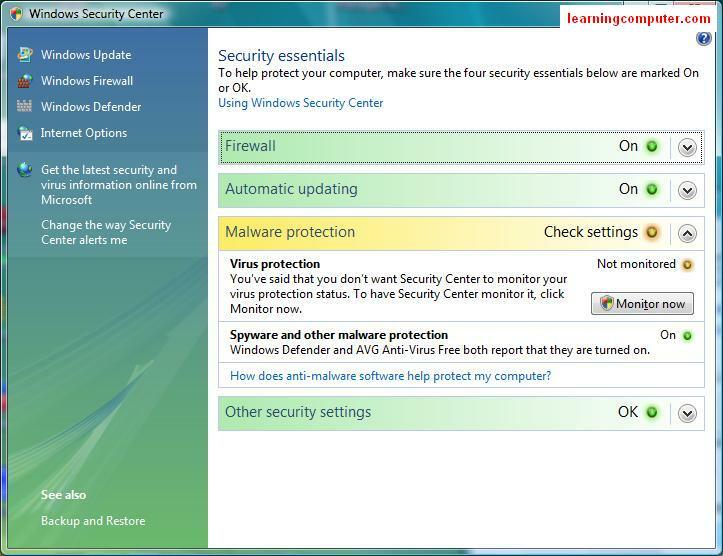 After we turned this protection on, the Security center is not reporting that we are indeed protected against viruses. Here is a screen shot of this shown below. – Try Microsoft Windows Training – Two thumbs Up!